Most cases of IMT of the bladder are idiopathic, but in some cases, there is a history of inflammation or irritation of the bladder. The size of the inflammatory myofibroblastic tumor/pseudotumor averages about 4 cm (range, 1.5-13 cm), [4, 9] which is similar to sarcoma at 4 cm (range, 0.5-7 cm). The mass is soft and fleshy. The usual appearance of inflammatory myofibroblastic tumor/pseudotumor is illustrated in the image below (see Image 1 in the figure below). Spindle cells are without atypia and have many stromal microvessels. On higher power, there are spindle cells without atypia, loose matrix, and frequent plasma cells—hence the synonym plasma cell granuloma, although it has been defined differently by some authors. Up to 50% of cases have muscularis propria invasion, but so do 50% of sarcomas. The degree of atypia is minimal, often with loose matrix and plasma cells (see Image 2 in the figure below). Microscopic findings of inflammatory myofibroblastic tumor of the bladder. Making a meaningful separation between inflammatory pseudotumor (a term used since 1937)  and inflammatory myofibroblastic tumor (IMT), a term introduced in 1990 for lung lesions, is more difficult. The oldest large series of 38 spindle cell tumors in the urinary bladder included 17 pseudotumors, 4 postoperative spindle cell nodules (PSCNs), and 13 sarcomas. The 17 patients in the pseudotumor group had no recurrence. The term IMT is now used more often than pseudotumor, but IMT may include a more aggressive but overlapping set of lesions. If the four criteria for inflammatory pseudotumor are applied, as listed above, the calls to discourage the use of this term might be premature. Thus, although the terms inflammatory pseudotumor and IMT represent more reactive or more neoplastic points on a spectrum leading to malignancy, there remains at least some histologic factors that predict behavior and there is some rationale to retain the use of both terms. No single definitive immunostain can make the differential diagnosis of inflammatory pseudotumor compared to other entities, such as sarcoma and sarcomatoid carcinoma. In a 2001 study, p53 protein nuclear immunostaining of sarcoma was moderate, unlike the rare to absent staining in pseudotumors (see image 6 in the figure below and in Microscopic Findings). Because all 12 sarcomas were desmin-negative, they were not called leiomyosarcoma; the frequencies of reactivity overlapped with benign tumors in epithelial (cytokeratins, EMA), mesenchymal (vimentin, desmin), and actin (muscle-specific actin and smooth muscle actin) immunostaining. A case report exists of a novel fusion of HNRNPA1-ALK in a middle-aged Japanese man with inflammatory myofibroblastic bladder tumor. The novel transcript fusion was on exon 2 of HNRNPA1 and exon 18 of ALK, which caused ALK protein overexpression. Cheng L, Foster SR, MacLennan GT, Lopez-Beltran A, Zhang S, Montironi R. Inflammatory myofibroblastic tumors of the genitourinary tract--single entity or continuum?. J Urol. 2008 Oct. 180(4):1235-40. [Medline]. Lewis PM. Inflammatory pseudotumor of the orbit: report of a case. Trans Am Ophthalmol Soc. 1937. 35:328-35. [Medline]. Satomi T, Watanabe M, Matsubayashi J, Nagao T, Chiba H. A successfully treated inflammatory myofibroblastic tumor of the mandible with long-term follow-up and review of the literature. Med Mol Morphol. 2010 Sep. 43(3):185-91. [Medline]. Montgomery EA, Shuster DD, Burkart AL, et al. Inflammatory myofibroblastic tumors of the urinary tract: a clinicopathologic study of 46 cases, including a malignant example inflammatory fibrosarcoma and a subset associated with high-grade urothelial carcinoma. Am J Surg Pathol. 2006 Dec. 30(12):1502-12. [Medline]. Zeng X, Huang H, Li J, Peng J, Zhang J. The clinical and radiological characteristics of inflammatory myofibroblastic tumor occurring at unusual sites. Biomed Res Int. 2018. 2018:5679634. [Medline]. Voelker HU, Kuehn D, Strehl A, Kircher S. Testicular inflammatory myofibroblastic tumor: a known entity at a very rare site. Case Rep Urol. 2017. 2017:1410843. [Medline]. Shanks JH, Iczkowski KA. Spindle cell lesions of the bladder and urinary tract. Histopathology. 2009 Nov. 55(5):491-504. [Medline]. Harik LR, Merino C, Coindre JM, Amin MB, Pedeutour F, Weiss SW. Pseudosarcomatous myofibroblastic proliferations of the bladder: a clinicopathologic study of 42 cases. Am J Surg Pathol. 2006 Jul. 30(7):787-94. [Medline]. Iczkowski KA, Shanks JH, Gadaleanu V, et al. Inflammatory pseudotumor and sarcoma of urinary bladder: differential diagnosis and outcome in thirty-eight spindle cell neoplasms. Mod Pathol. 2001 Oct. 14(10):1043-51. [Medline]. Williamson SR, Lopez-Beltran A, MacLennan GT, Montironi R, Cheng L. Unique clinicopathologic and molecular characteristics of urinary bladder tumors in children and young adults. Urol Oncol. 2013 May. 31(4):414-26. [Medline]. Pettinato G, Manivel JC, De Rosa N, Dehner LP. Inflammatory myofibroblastic tumor (plasma cell granuloma). 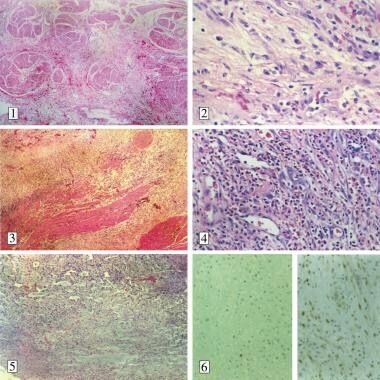 Clinicopathologic study of 20 cases with immunohistochemical and ultrastructural observations. Am J Clin Pathol. 1990 Nov. 94(5):538-46. [Medline]. Chan JK, Cheuk W, Shimizu M. Anaplastic lymphoma kinase expression in inflammatory pseudotumors. Am J Surg Pathol. 2001 Jun. 25(6):761-8. [Medline]. Coffin CM, Hornick JL, Fletcher CD. Inflammatory myofibroblastic tumor: comparison of clinicopathologic, histologic, and immunohistochemical features including ALK expression in atypical and aggressive cases. Am J Surg Pathol. 2007 Apr. 31(4):509-20. [Medline]. Gleason BC, Hornick JL. Inflammatory myofibroblastic tumours: where are we now?. J Clin Pathol. 2008 Apr. 61(4):428-37. [Medline]. Sukov WR, Cheville JC, Carlson AW, et al. Utility of ALK-1 protein expression and ALK rearrangements in distinguishing inflammatory myofibroblastic tumor from malignant spindle cell lesions of the urinary bladder. Mod Pathol. 2007 May. 20(5):592-603. [Medline]. Rao RN, Ranjan P, Singla N, Pandey R. Inflammatory myofibroblastic tumor of the urinary bladder diagnosed by anaplastic lymphoma kinase immunostaining. Urol Ann. 2012 May. 4(2):115-8. [Medline]. [Full Text]. Choi E, Williamson SR, Montironi R, et al. Inflammatory myofibroblastic tumour of the urinary bladder: the role of immunoglobulin G4 and the comparison of two immunohistochemical antibodies and fluorescence in-situ hybridization for the detection of anaplastic lymphoma kinase alterations. Histopathology. 2015 Jul. 67(1):20-38. [Medline]. Teoh JY, Chan NH, Cheung HY, Hou SS, Ng CF. Inflammatory myofibroblastic tumors of the urinary bladder: a systematic review. Urology. 2014 Sep. 84 (3):503-8. [Medline]. Westfall DE, Folpe AL, Paner GP, et al. Utility of a comprehensive immunohistochemical panel in the differential diagnosis of spindle cell lesions of the urinary bladder. Am J Surg Pathol. 2009 Jan. 33(1):99-105. [Medline]. Inamura K, Kobayashi M, Nagano H, et al. A novel fusion of HNRNPA1-ALK in inflammatory myofibroblastic tumor of urinary bladder. Hum Pathol. 2017 Nov. 69:96-100. [Medline]. Epidural Anesthesia and Cancer Outcomes in Bladder Cancer Patients: Is It the Technique or the Medication?